If you read my blog live on the site (as opposed to in a feed), you may have noticed a new banner ad on the right-hand side. I didn’t create this blog to make money and I definitely don’t want it overrun with ads, but if I can make a few pennies here and there without taking away from the quality of my blog, I’m okay with that. National organizations, who want to radically redefine marriage, have taken this fight to scores of states and cities across the country. Maine is their latest target; it has become ground zero in the battle over the traditional definition of marriage. The People’s Veto of Gay Marriage – Question 1 – needs your financial contribution. Your support will help us stand up to the vast network of wealthy homosexuals with seemingly unlimited resources from places like Hollywood, New York and Massachusetts. Washington, D.C.’s largest national lesbian, gay, bisexual and transgender civil rights organization has already pledged to spend as much as $5 million to try to defeat us. We need to raise a significant campaign treasury to successfully restore marriage in Maine. Please make a generous contribution NOW and help us spread the word about Question 1. I’m going to allow the ads to continue to run on my site, because really, they’re paying for it to be on my page. I don’t expect many of my readers to actually be swayed by the ad, so I’d rather have SFMM’s money wasted on my little site than actually contributing to a viciously discriminatory campaign. 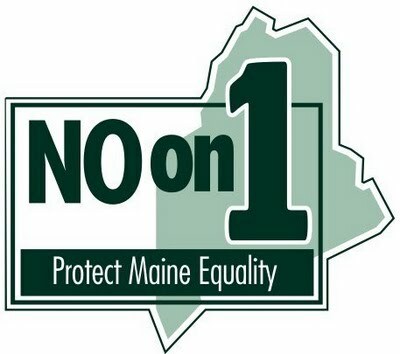 I would encourage all of my readers to consider supporting the No on 1 Campaign. We cannot tolerate rights being voted away. Click below to see how you can help. On November 3, let’s protect equality in Maine and across our country.